Rockets and missiles have been too much with us. Where do the words come from? Originally referring to “fireworks,” rocket derives from the Italian rocchetto–passing into English from the French roquette in the early 1600s–where it referred to something far gentler and more productive: a “bobbin,” a spool around which yarn is wound. 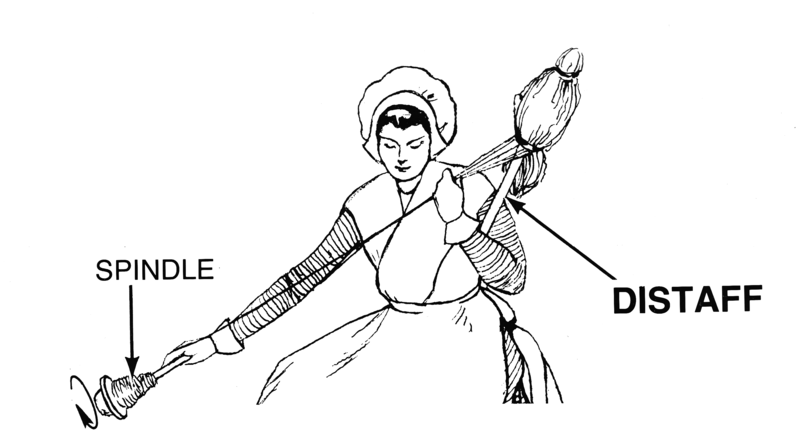 The word is a diminutive form of rocca, a “distaff,” a textile technology similar to the “bobbin” in that it is a staff for holding flax, wool, or other fibers for spinning. The propulsive rocket, then, is named from its resemblance to the cylindrical shape of the distaff. “Distaff” by Pearson Scott Foresman. Courtesy of Wikimedia Commons. That puts a whole new spin on yarn bombs, doesn’t it? I think we should put seamstresses and tailors in charge of geopolitics. Related are ratchet (from the French racquet, “head of a lance”) as well as rocambole (a kind of garlic, shallot, or leek, via the Germanic rocko) and rochet (from French, naming the white “over-tunic” for priests’ choir dress). Rochet‘s clerical associations lead us to the frock, whose unknown origin a few have placed in *ruk-. Mass, mess, missile, mission, missive, admit, Christmas, commit, compromise, demit, dismiss, emit, intermit, intromit, Lammas, Martinmas, Michaelmas, omit, permit, premise, pretermit, promise, remit, submit, surmise, transmit. Get the message? That’s another. The first sense seems to have been ‘to throw,’ as cow dung at a wall, to dry for fuel. I have seen freight cars at a siding in India with their south sides completely covered with spats of drying dung. There’s no conclusive evidence for Shipley’s etymology, but, hey, I’ll take yarn bombs and flung dung over rockets and missiles any day. Except for space rockets. I think we’re all secretly–hell, openly–space nerds.